Obama appeared on stage next to Lady Gaga, Jada Pinkett Smith, Jennifer Lopez and presenter Alicia Keys. "From the Motown notes that I've worn down on the south side," Obama began, but was immediately drowned out in thunderous applause from the crowd. After sustained applause, Obama laughed and said, "Alright, all right, we have a show to do." 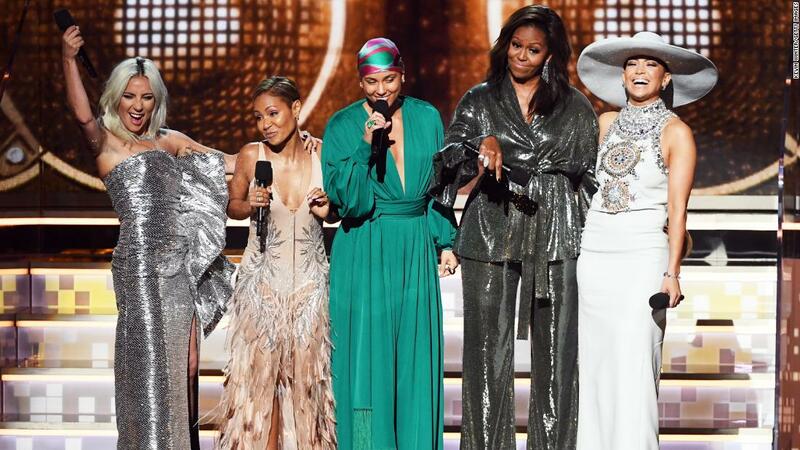 "From the Motown recordings that I carried on the South Side to the songs" Who Run the World "that have fueled me over the last decade, music has always helped me tell my story "Obama said. 1; our dignity and sorrows, our hopes and joys," continued the former First Lady. "It allows us to hear each other, invite each other." "Music shows us that everything is important, every story in every voice, every note in every song – is that the right lady?" Obama asked and looked at the women on stage. Obama's recent "Becoming" memoir quickly became a bestseller and became one of the most popular books of the decade. Obama has sold out arenas on their massive international book tour, including interviews with Oprah Winfrey, Reese Witherspoon, Sarah Jessica Parker, and former Obama Senior Advisor Valerie Jarrett. Obama posted on Twitter after the Grammy gig: "Much of the friendship shows up for your girls – that's why I was thrilled that I was at the #GRAMMYs for the only @ aliciakeys you did is one of the most sincere and thoughtful people I know – there is no better one that supports us all in celebrating the unifying power of music! "